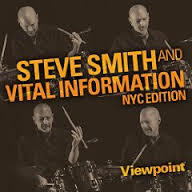 To finish the review of new CD releases in 2015, I would like to present a CD from drummer Steve Smith. I had the chance to see him this fall live in Bern and since there are not so many bands led by a drummer it is always surprising to see how rhythm-based those bands are. Steve Smith plays on this CD with Baron Browne on bass, Vinny Valentino on guitar, Andy Fusco on sax, and Marc Soskin on piano plus Walt Weiskopf as special guest on two tunes. All musicians are with Steve for a long time and seeing them live you felt the connection and the blind relation they have to each other. Special seemed to me the connection to Marc Soskin. He and Steve Smith were really inspiring even pushing each other during the show. The material on the CD includes originals by Steve Smith and Vinny Valentino and some real classics like “Oleo”, “Bemsha Swing” or “Take Five”. Steve Smith got also the chance to shine with his drums on three short pieces called “Viewpoint One”, “Viewpoint Two” and “A Final Viewpoint” which is like the golden thread running through this album. So, if you like a band where the drums give the pulse then this CD is a clear recommendation and if you have the chance to see Steve Smith live, please do that. He is a great musician and he will not disappoint you. One of the most important CDs of this year is definitely Kamasi Washington’s album “The Epic”. This album is was released on May 15 and from the start it was clear that something special happened here. The album has 3 CDs with a total playtime of 172 minutes, the band has two drummers, two bass players, one of them is Stephen Bruner aka Thundercat and a choir and an orchestra support the band. But the music is definitely Jazz music even if some of the members of the band and Kamasi himself have been known from working in other genres like film music or Hip-Hop. The songs on the first two CDs area all original compositions by Kamasi Washington, the last CD (labeled The Historic Repetition) contains material from Terence Blanchard (“Malcolm’s Theme”), Claude Debussy (“Clair de Lune”) and the famous standard “Cherokee” ( a rather relaxed arrangement here). My personal favorites of this CD are the first song on the first CD “Change of the Guard” and the relaxed “Cherokee”. This album is one of the candidates for the best Jazz albums of this year, it is unique and outstanding in terms of performance and inspiration and it might have what it takes to make a new generation listening to Jazz music again. 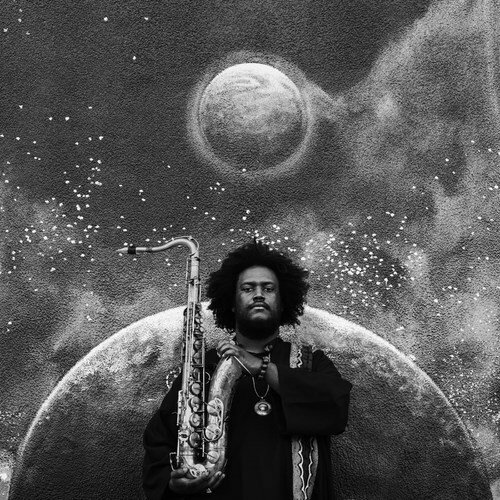 Kamasi is at the moment in Europe, unfortunately there was no concert in Switzerland. But let’s hope we are able to see him next year.